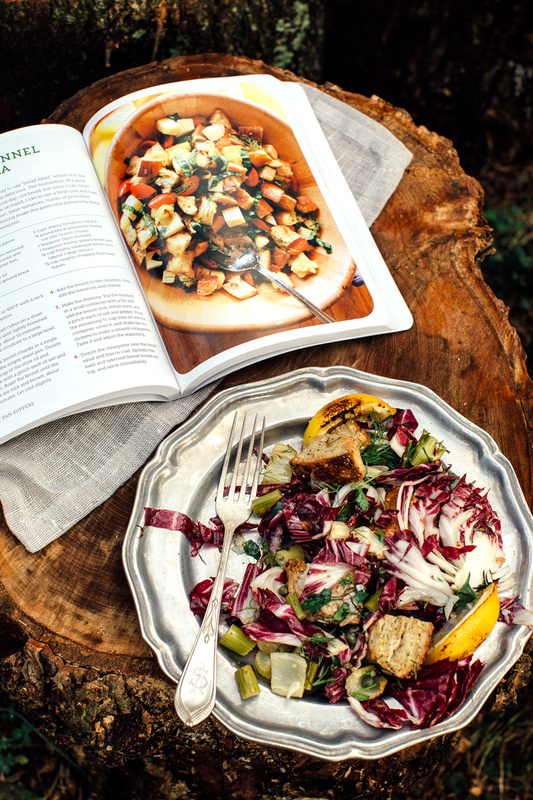 Roasted Fennel Panzanella + a Giveaway! Hey! It’s hot here (like 85 degrees last weekend!) so I made a salad! Ice cream would’ve probably been good too but we’ll have lots more warm weather opportunities for that – plus my blogger friend Molly shared her amazing book with me and I just couldn’t wait to cook from it! The book is called Sheet Pan Suppers, so yes, you guessed it – all the recipes in the book are made using a sheet pan, 120 recipes to be exact. 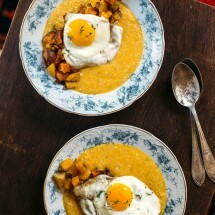 This book has it all, hearty ratatouille with goat cheese, falafel bites – even ice cream. Roasted banana sundae’s… mmmm. Ok, ok back to the salad. 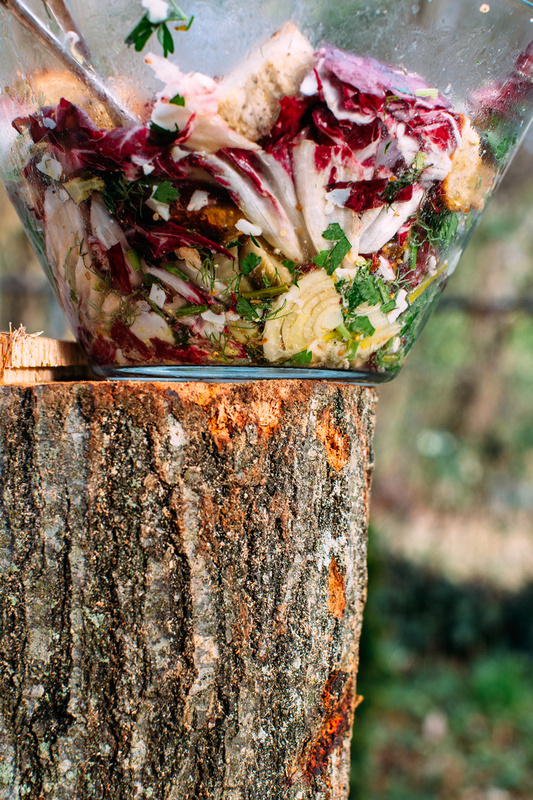 Panzanella, aka, bread salad, aka delicious is what this is. 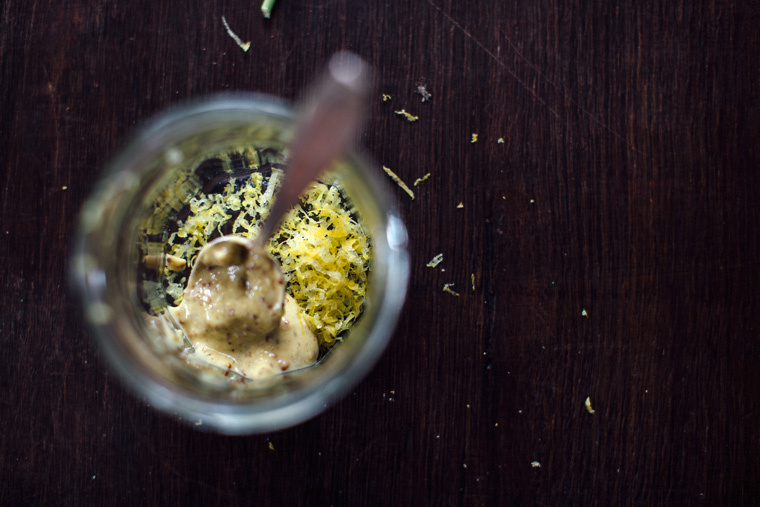 I’m officially obsessed with this dressing made with lemon zest which made me realize I need more lemon zest in my life, it just makes everything better. 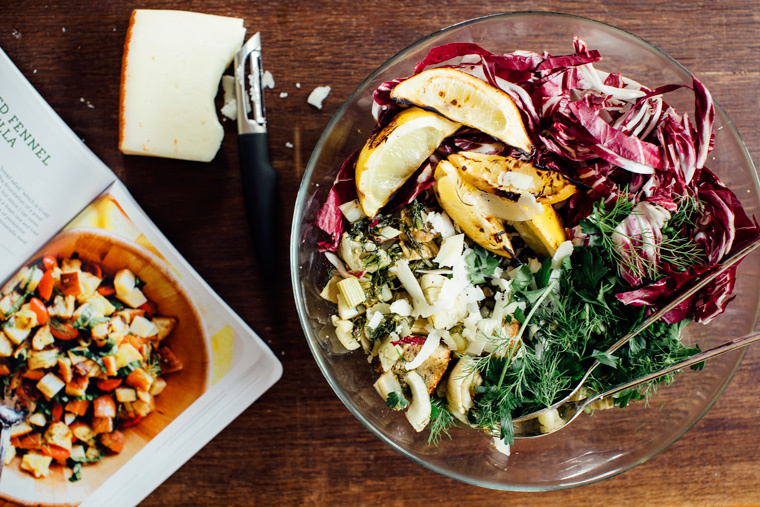 This salad has all the bright, bold flavors of Spring – roasted fennel, fresh parsley and lemons that I put under the broiler for extra lemony sweetness. Also manchego – pretty much my favorite cheese ever. So what’s more exciting than taking a bite of this fresh, zesty bread salad?! 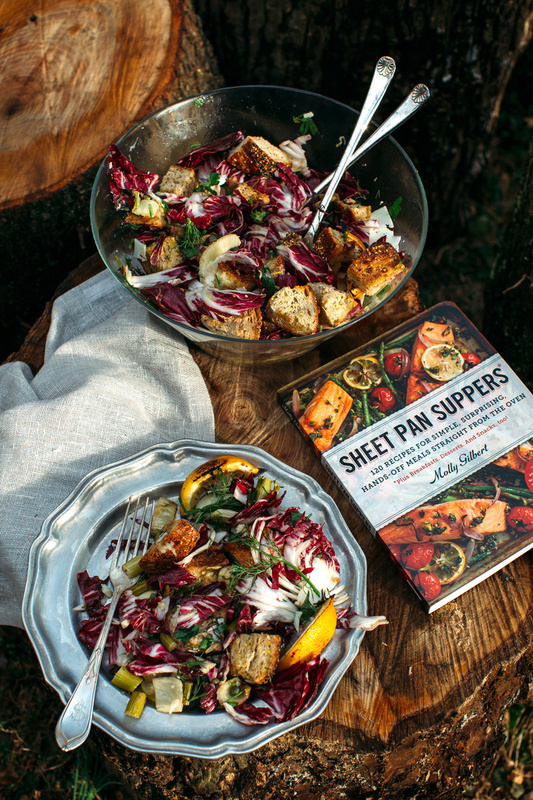 I’m giving away a copy of Sheet Pan Suppers to one of my lucky readers today! Hooray! Just enter your email into the ContestHopper widget below! While the bread is toasting slice up the fennel. The stalks don’t bother me, I just eat them too. Save some of the fronds for garnish. While the fennel roasts at 400F for 20 minutes make the dressing. Slice the lemon and place under broiler for 5 to 10 minutes until a little charring occurs. 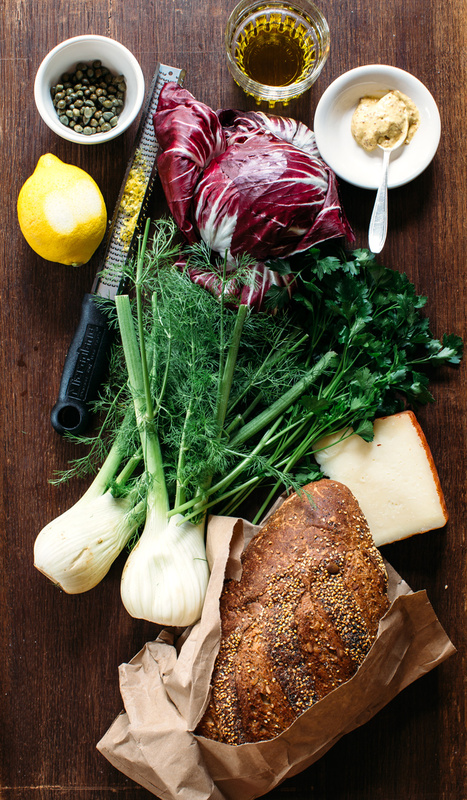 Slice up the radicchio and parsley and toss it all together with the rest of the ingredients in a big bowl. 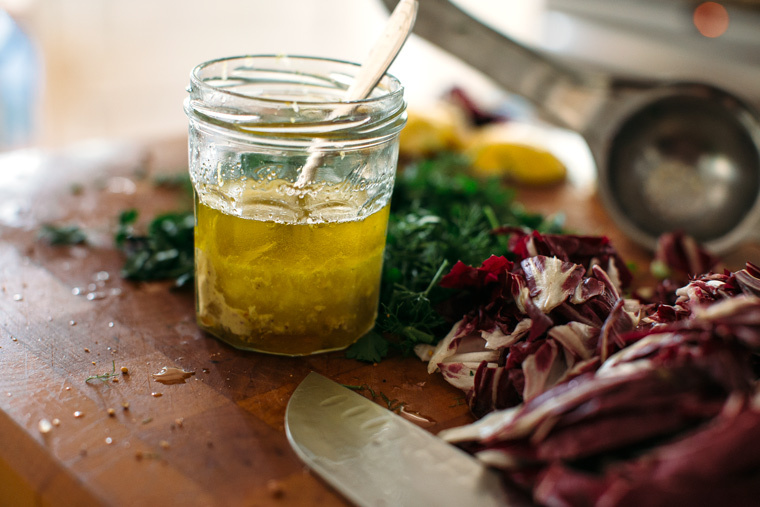 Combine all the ingredients for the dressing into a jar with a lid and shake it up! Preheat oven to 400F. Cube the bread. 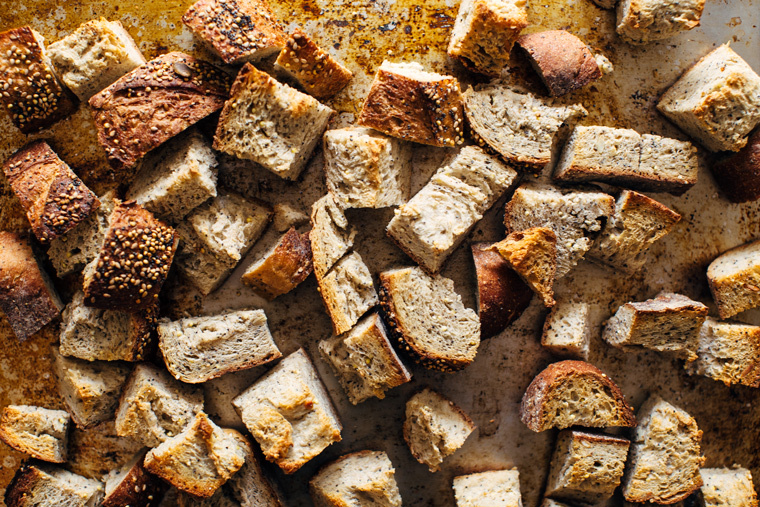 Toast the bread in the oven until light brown and crunchy, about 10 minutes. While the bread is toasting slice up the fennel. The stalks don’t bother me, I just eat them too. Save some of the fronds for garnish. 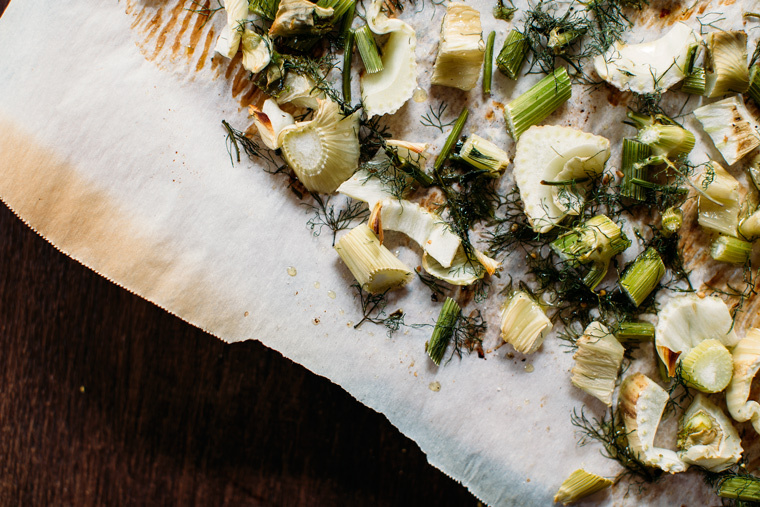 While the fennel roasts at 400F for 20 minutes make the dressing. Combine all the ingredients into a jar with a lid and shake it up! 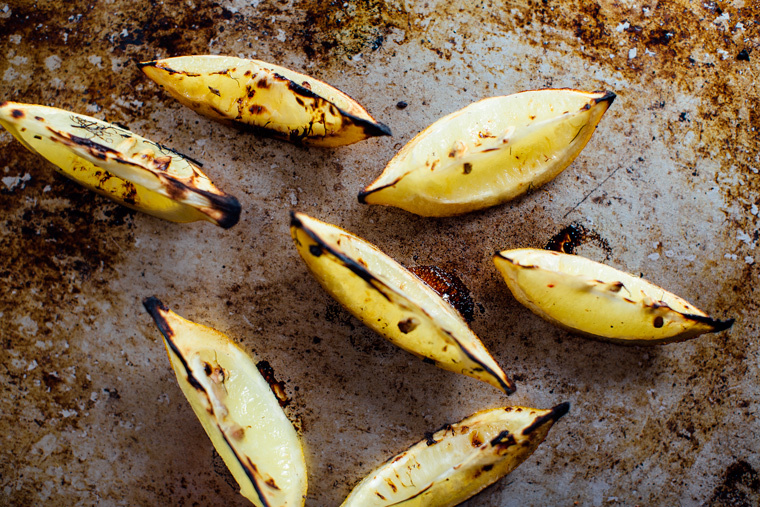 Slice the lemon and place under broiler for 5 to 10 minutes until a little charring occurs. 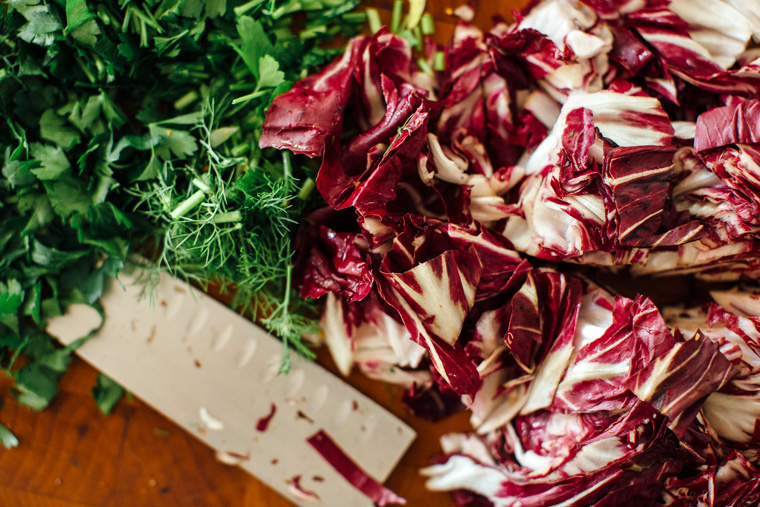 Slice up the radicchio and parsley and toss it all together with the rest of the ingredients in a big bowl and top with the dressing. 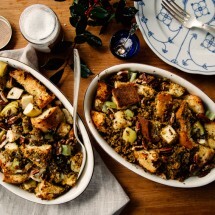 Recipe inspired by the Roasted Fennel Panzanella in the Sheet Pan Suppers Cookbook. Molly shared this lovely book with me to share with a lucky reader. All opinions are always my own. Giveaway open to US and Canadian residents. Winner will be chosen at random. Last day to enter is March 27th. Winner will be announced on March 28th. 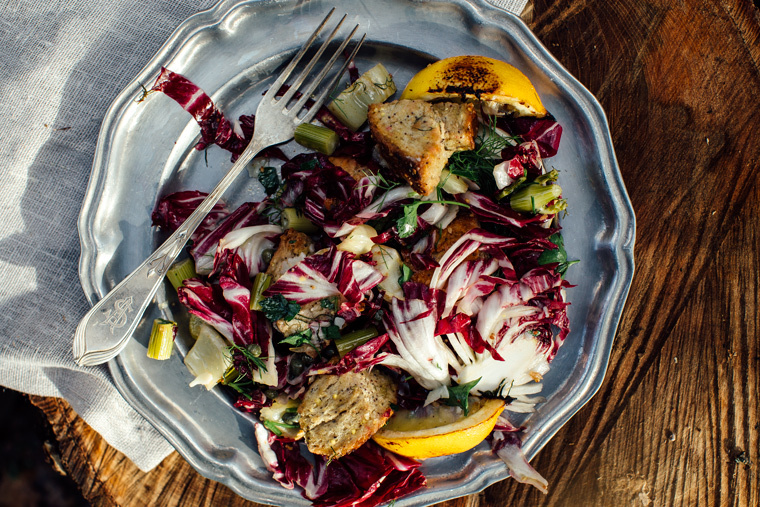 That is one gorgeous panzanella – radicchio AND fennel!? I’m in. Clearly I need to order that book…. Thank you Marissa! And yes! 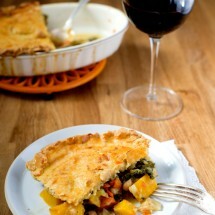 This book is filled with so many yummy, approachable recipes – it will be a well used cookbook for sure! 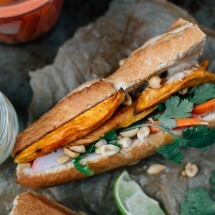 I love this sheet pan-based recipe idea. What a great focus for a cookbook. 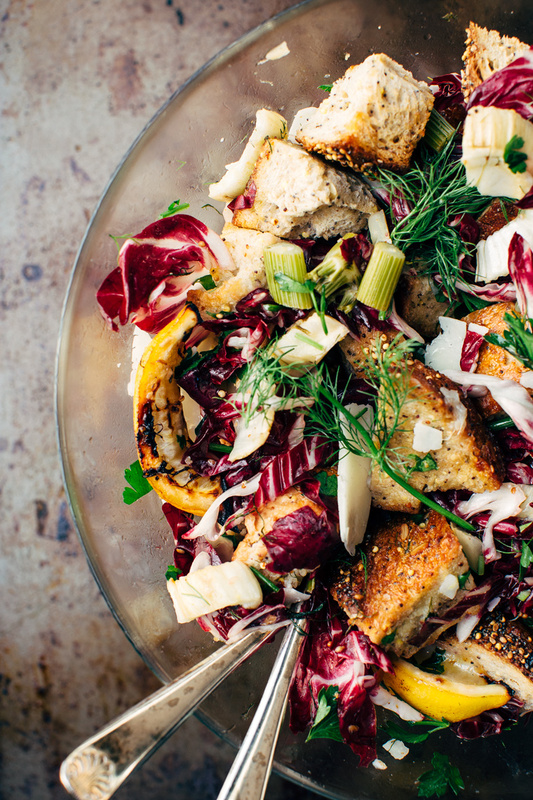 And I’m drooling over the flavors and ingredients in this panzanella salad, so it’s going on my list to make soon. I love this recipe, friend. This is so colourful, bright and beautiful. 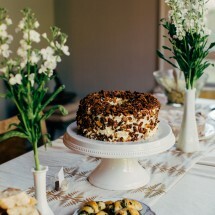 It is a great fresh recipe to welcome spring. Ah I can’t forget to say your pictures are GORGEOUS as usually! Have an a awesome sunday, my dear! Thank you so much Olivia! So happy spring is finally here! Thank you Nicole! And yes! 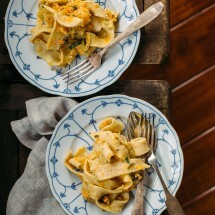 Molly’s book is so great – every dish is easy AND gorgeous! That Molly sure has the sheet pan situation dialed! And I especially love all the colors in this salad. I’m eating it up just looking at it!!! Love Molly, love her book, love bread in my salad. Yesss!! Thank you so much Laura! xoxo!! Grace, I made this salad on Saturday and we loved it. Admittedly I used cannellini beans in place of the bread, so it wasn’t technically panzanella, but I loved the flavors and ingredient combination from the radicchio, fennel, capers, and manchego. Oh Katie, good idea! This salad with beans sounds so good! So glad you enjoyed it as much as we did!